Today we're sharing toddler activities starting with the letters P through T! (Yesterday we shared activities K-O, Tuesday we shared activities F-J and Monday we shared A-E, so check them out on our ABC's series landing page if you missed them). Many of these activities aren't just for toddlers, so try them out with your big kids too! Have you made puffy paint with your toddler? There are lots of different versions out there, but we decided to make microwave puffy paint using water, flour, food coloring, and salt. 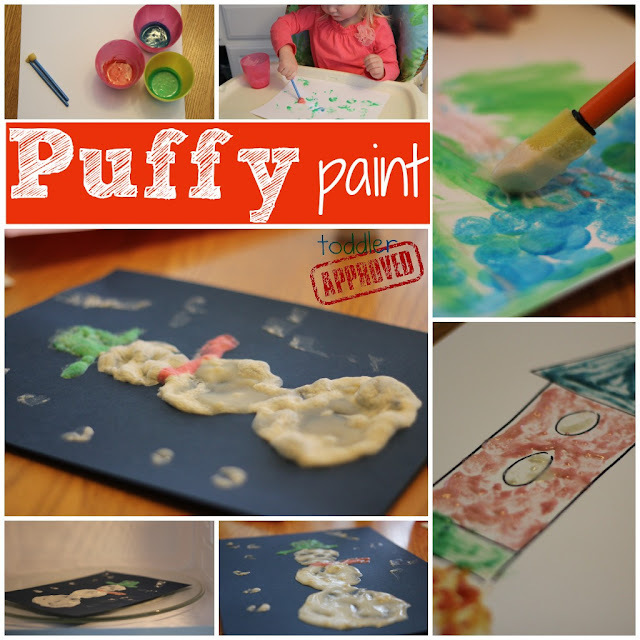 We basically followed this puffy paint recipe from Inner Child Fun & Play At Home Mom. Inner Child Fun made puffy paint snowflakes that were adorable! Since this was our first time exploring puffy paint at home, we didn't have anything in particular we wanted to make. We just played. We made snowmen, rockets, and just random dots. My son also makes puffy paint at school and they do the glue and shaving cream version. Allie at No Time for Flashcards has shared several Puffy paint activities that she's done with her daughter, so shaving cream puffy paint is next on our "to do at home" list (once I make it to the grocery store). Next in our alphabet is Q for quiet activities! Toddlers love to make noise, but it is great to help them learn how to enjoy quiet time and quiet activities... especially when you're in places where they can't be so loud (church, restaurants, etc.). I shared this post about helping to transition your child to a successful quiet time (once they give up naps) and thought I'd share a few of our favorite quiet activities with you! 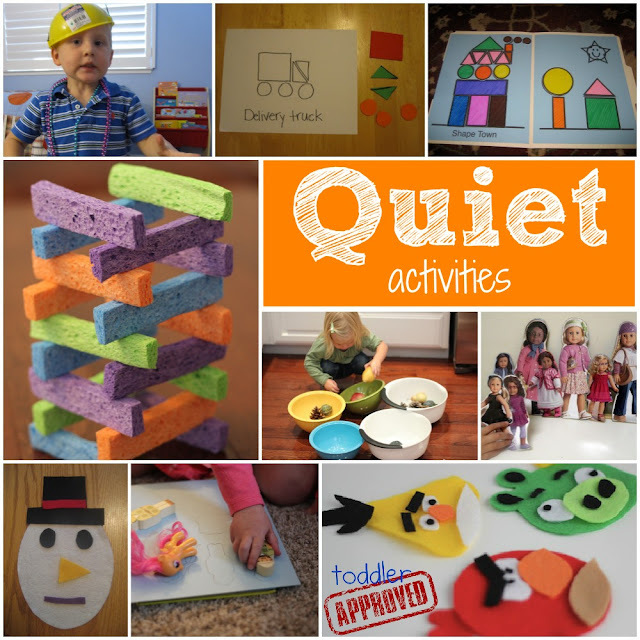 These activities are helpful at our house when the baby is sleeping and my toddler and preschool are up and wanting to be creative! This post over at Kids Activities Blog also has loads of calming or quiet activities. I also love this series by My Delicious Ambiguity filled with busy bag ideas for when you are out and about (or home) and kids need to be active and quiet. My Small Potatoes also features several busy bag ideas. There were loads of things we could've picked to focus on for letter R, but at our house my toddler's favorite activity is Reading, so we had to include it! We read tons and tons of books every day. If my toddler is in reading mode she will sit and listen to 20 books at a time. She loves cuddling up on my lap and listening to books. In addition to reading books, we love to do book-related crafts and activities and participate in our monthly Virtual Book Club for Kids. A few of my favorite blogs that LOVE books are The Educators' Spin On it, Rainy Day Mum, and Mommy and Me Book Club. Check them out if you want some great ideas. Yesterday we asked our Facebook readers what their toddler's favorite books are right now, and we got a huge long list! 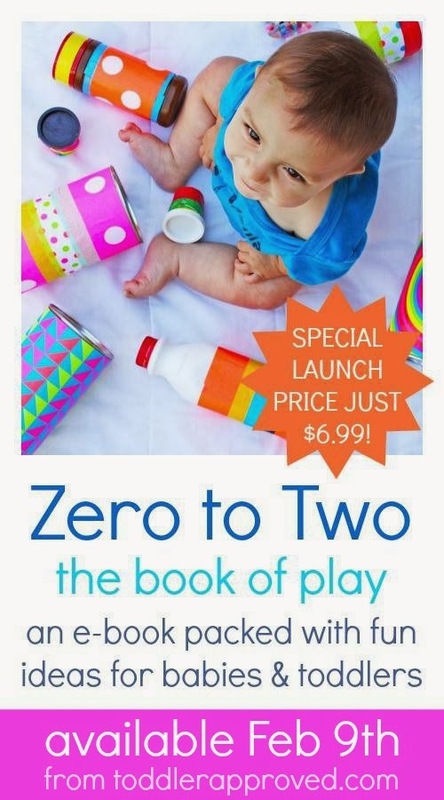 If you are looking for new book ideas for your toddler, click here and go check out the list. I'd love for you to share any other favorites in the comments of this post. I am always looking for new books to buy or grab from the library! 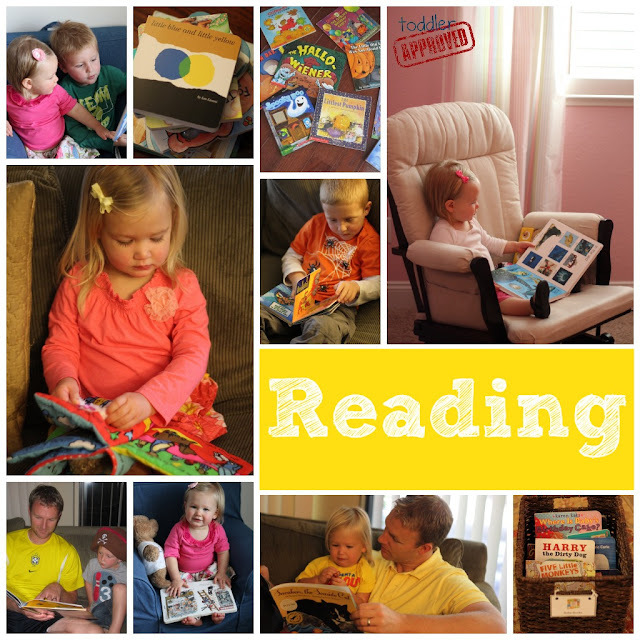 Do you have a special spot or book reading routine with your toddler? I love to read books aloud during meal times or cuddle up with my kids first thing in the morning on the couch. We also love to just declare it "reading time" and we grab a pile of books and pillows and read together... sometimes we even grab snacks to bring with us... kinda like a little mini read-a-thon. There are so many great ways to embed reading into every day! How do you do it? Sensory play is honestly not something we do enough of at our house... other than painting. My goal for this next year is to explore with new materials and expose my toddler to more experiences. She is very concerned about getting messy so I'm hoping to help her move past that a bit. 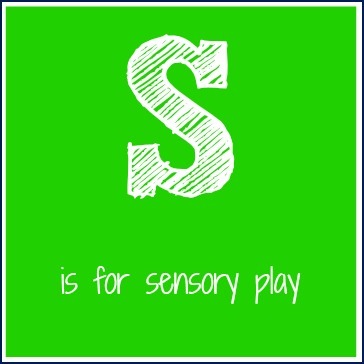 I think of sensory play as any activities using our five senses- touch, taste, smell, sight, hearing. I typically focus on the touch and taste senses... so I want to mix it up a bit in the next year. Creative Playhouse is sharing loads and loads of Sensory Play ideas as part of this ABC's series... so head on over to get some new ideas. 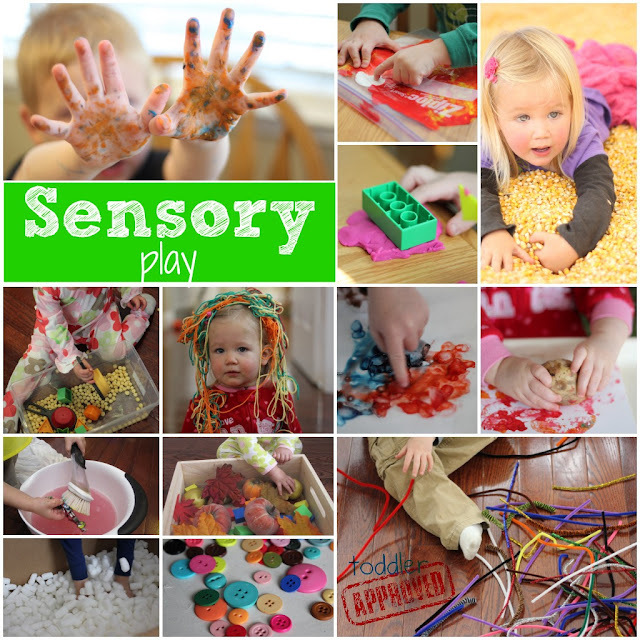 Some of our favorite sensory activities include playing and exploring with water, packing peanuts, buttons, pipe cleaners, pom poms, whipped cream, yogurt, cereal, ice, playdough, paint, yarn, sand, shaving cream, and loads and loads of other materials outside in the backyard. Yesterday we played with goop and ice (via Growing a Jeweled Rose) while I was making dinner and the kids had a blast. Do you have a favorite sensory material? What sensory materials do you need/want to explore more? 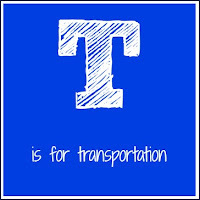 We are HUGE fans of anything related to transportation at our house... cars, trains, trucks, planes... you name it, we love it. Our kids love trash day and are glued to the window all morning watching for the trucks. My toddler also spends a good portion of her day driving trains around our train table or flying her Little People airplane around the house. 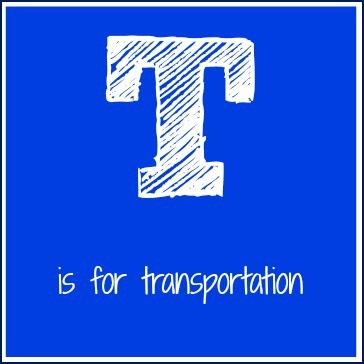 I am always looking for a new transportation themed activity or craft to try. Below I am featuring a few of our favorites. Yesterday we made cardboard box cars (decorated with stickers and dot markers) and we watched our current favorite movie (Wall-E) in our family room with popcorn. The activity was a hit and it was fun watching them pretend to drive their cars around. We also have a post featuring 11 ways to play and learn with toy cars! 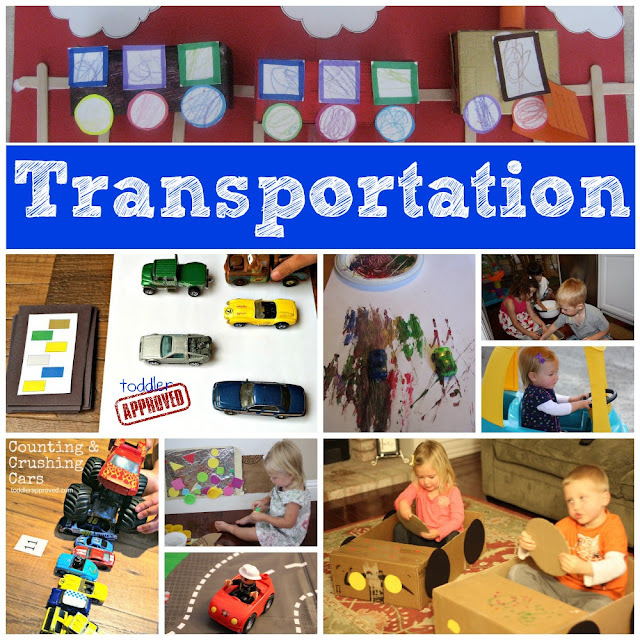 Hands On: As We Grow has an awesome collection of 35 Vehicle Activities just in case you are looking for even more transportation-themed ideas for your little ones! We have had such a fun week playing at our house and trying out many of our favorite P-T activities again and again. I'd love to hear your other favorite toddler activities that start with P-T , so add them in the comments and if you have a blog post link or photo, come share on our Facebook wall! Tomorrow I'll be sharing the last part of our toddler activities series. All of our activities will start with the letters U, V, W, X, Y, and Z! 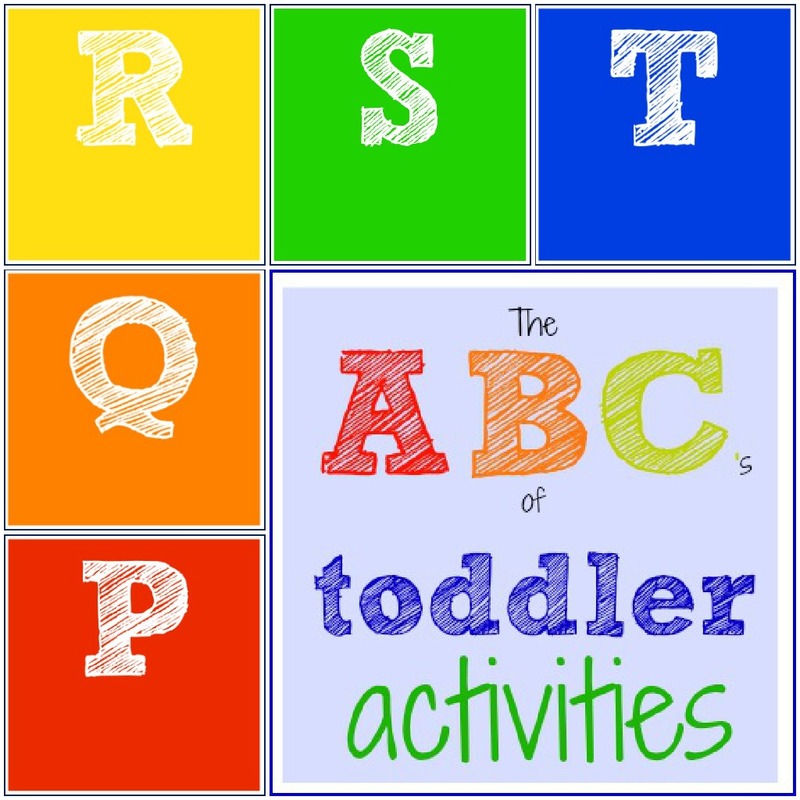 Your ABC series is so wonderful I just wish my kiddos were still toddlers to do some of the activities! Thanks PragmaticMom! I appreciate you stopping by to comment. I think you'd be surprised though, many of these activities can be done with older kids too :) I had just as much fun as my little ones and did many of these projects when I taught 3rd and 4th grade as well.